Purchase your copy of The ME-gan Lifestyle for only $9.00 plus shipping! This includes a free autograph or a personal dedication by the author; simply provide the instructions in your email. This offer is exclusive to this website. Email your order to Crashintome63@yahoo.com. PDF Format also available for only $4.00. Why wait? Start reading in just minutes in full color! The ME-gan Lifestyle leads the way to Health, Happiness and Optimal Mind & Body, so you can truly live, love & be happy! Rediscovering yourself is the extreme pleasure you don’t want to miss out on! The ME-gan Lifestyle is coming soon to a traditional bookstore near you! Hooray! I am very excited for you and have enjoyed your blog! I am learning so much and am uplifted by your posts !!!! Thank you ( and Lee too!). ME-gan Lifestyle. It was excellent on many levels. book in the library? Under – Health and Nutrition? Motivational? Or under Self-help or Body and Mind?? doesn’t love company, – happy people foster happy people. India are fond of saying: Have a great day and a better tomorrow. I believe that is the essence of the ME-gan Lifestyle. Wow! You just have given me my dream come true – the endorsement that I could only hope for. This is truly what I envisioned when first setting out to write this book. The ME-gan Lifestyle was divinely inspired, and it’s meant to reach and touch many, many people. Thank you for reading it and thank you for your feedback! On we go now…a cookbook? Just finished reading the Me-Gan Lifestyle! What an uplifting read. It takes you on a journey filled with emotion. It is a testimony to the power we all have over our life if we can just discover it. 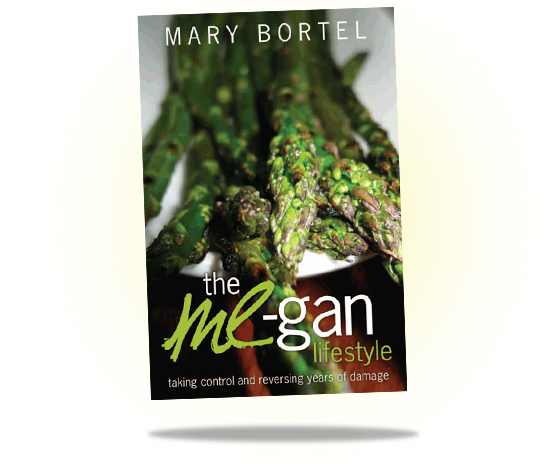 To hear Mary Bortel openly tell us of her struggles in life an how she liberated herself with the Me-Gan lifestyle is truly moving. I assume the writing of the book was just another step in her liberation. Thanks to Mary for writing the book and sharing her experiences. It is sure to bring many of us to explore the benifits of the Me-Gan lifestyle! At a time when Obesity is so prevelant I can see this book being a major motivational tool for many. Take control! Do yourself a favor! Buy the book!